Amongst the many things that my parents dragged across the ocean for us, was a nice stack of English-language children’s books. Since we got back from Easter holidays (which was now ages ago), we’ve been enjoying reading them and appreciating how they have allowed us to reflect and discuss what’s going in our lives. Finding relevant books is one of the main ways I open up a dialogue with my kids in dealing with whatever issues they are going through. More Maurice Sendak for a boy who loves Where the Wild Things Are. Stella loved Dragons Love Tacos, and now she loves Secret Pizza Party. The runaway favorite for my girls and me has been Grace Lin‘s Pacy Lin books. While researching picture book publishing and other Asian American authors and thanks to a tip from my talented and resourceful critique partner Barbara DiLorenzo, in addition to what my parents brought I borrowed all of the electronic versions of Grace Lin books I could from my local (American) library. I started reading the The Year of the Dog on my own and when I found myself sucked in and unable to wait to find out what happens next to Pacy, I knew I had to stop, start over and share this character with my daughters, particularly my first grader. While the Pacy Lin books were sometimes a bit too long and more complicated for my five-year-old, she still liked to listen in and follow along even if it was occasionally with half an ear. So many important, relevant and wonderful aspects about these books: Grace is a second-generation Taiwanese American grade school girl who comes from a nice family. You get the feeling that she knows she’s coming from a nurturing place – two communicative parents who care about her and are actively helping her make the best of her life. She has a happy, functional home life full of normal sibling relations with two sisters. Along with making sense of being Asian, second-generation Asian, and being ethnically Taiwanese and Chinese, Pacy’s struggling with all of the normal growing pains. The conversations she has with herself along with her friends and family are natural and not forced and fabricated. You really empathise with what she’s experiencing: finding a best friend, losing a best friend, and finding her place in her class. She struggles when a new classmate from China arrives since she feels the need to disassociate herself from him when she realises that her classmates perceive them as the same just because they are both Asian even though they are of course quite different. At the same time she identifies that indeed because they are both Asian, they are somehow in the same tribe. The anecdotes from Pacy’s parents are particularly awesome. They’ve been launching points for my kids and me to discuss what life might have been like for their Korean grandparents in Korea and what immigrating to Germany or America way back in the 60s must have been like. It has also reminded them of the perspective that their own mama didn’t speak any German when she first arrived in Germany right before they were born. I am so grateful for the verbal and graphic illustrations of these Pacy Lin books. They’ve really helped me have much more productive dialogues with my kids not only about their heritage, but also how they might feel and how they might react if kids at school taunt them or make inappropriate remarks or sounds. As a bonus, Year of the Rat touched on the relevant theme of moving when Pacy’s best friend Melanie moves away. A great picture book about moving. Which brings me to the next important theme on our reading list: moving! 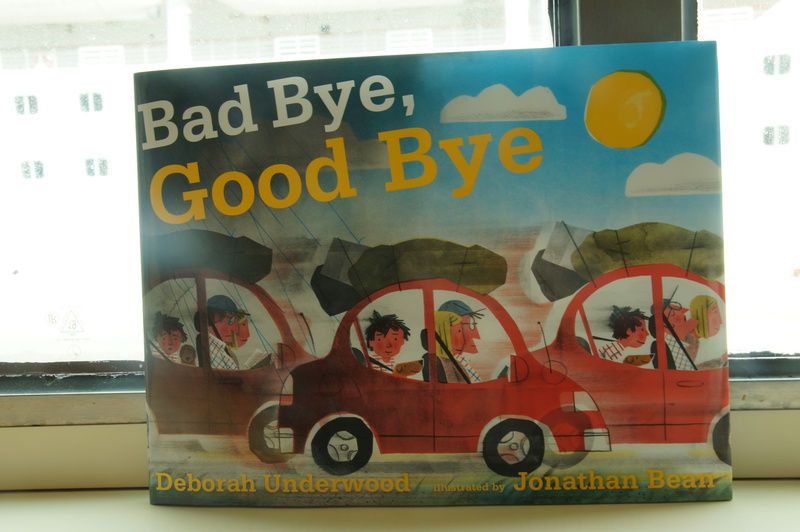 I found Good Bye, Bad Bye when the book’s author, Deborah Underwood, was Julie Hedlund’s featured author. When I read the book’s description, I thought that this would be a great primer for my younger kids as we prepare for our move to Essen. Sweet, concise and poignant, this book is the kind of picture book poetry I strive to create. The illustrations are wonderful as well. Jonathan Bean’s art appeals to kids in a clean, attractive way. But just because they are meant for a picture book shouldn’t make you dismiss them. He subtly draws in what I call transparent scenes that my kids saw before I did such as the playground in front of the new house. You get a sense of reluctance, sadness and then shedding and moving forward into a transitional and then new beginning phase. My kids like the book as well; it’s the right balance of being a simple yet relatable story. And while I was hoping it would help them understand what to expect next, I think it has been bitter sweet for me to read, anticipating the sad partings and farewells waiting for us around the corner, and summoning the energy and brave face to make new friends in our new home. Tags: Bad Bye Good Bye, book review, books about moving, children's books, Deboarh Underwood, expat moving, expatkimchi, Good Night Good Night Construction Site, Grace Lin, Jane, Jonathan Bean, Maurice Sendak, moving, Pacy Lin, picture books, Rosie Revere Engineer, Secret Pizza Party, Year of the Dog, Year of the Rat. Bookmark the permalink.